What are the default key bindings for mame games? I can get it run, but can never insert a coin or start the game. Im using a keyboard. Or at least wheres the config file to change the key bindings? Hi, for the MAME-coin-problem you might have a look at https://github.com/retropie/RetroPie-Setup/wiki/Has-anyone-figured-out-how-to-insert-coins-in-imame4all-yet%3F. There are also reports that the USB keyboards stops working when starting a rom, though. The key mapping can be configured in RetroArch’s configuration file, see https://github.com/retropie/RetroPie-Setup/wiki/RetroArch. Regarding the speed issues it seems that a moderate overclocking is needed for a smoother gameplay, see also https://github.com/retropie/RetroPie-Setup/wiki/Speed-Issues. I am currently using the standard Raspbian distribution (2012-08-16), and I installed from source (it didn’t take as long as I had expected), but when I tried to start it for the first time (with no ROMs in the folders), all that happened was a white dot showed up in the middle of the screen. I tried again later, after adding ROMs, but it still didn’t work. I am using a 5V 2A power adapter, an Apple Aluminum Keyboard, a 16GB micro SD (not sure what class, probably 4) with an adapter, and I have my Raspberry Pi overclocked to 900 MHz with 500 MHz SD RAM frequency. I have tested on both HDMI (at 1920×1080) and composite (RCA) video (not sure what resolution, but it was 4:3), and with and without ethernet plugged in. Any suggestions? Hmm, I am not sure about the 500 MHz. To be on the safe side you might decrease the frequency until you have a working emulator. As a next step I would try to start a rom without Emulation Station, see https://github.com/retropie/RetroPie-Setup/wiki/How-would-I-start-from-command-line,-say,-the-SNES-emulator-by-itself%3F. If this is not working, you could post your debug.log here or at the Raspberry forum threat at http://www.raspberrypi.org/phpBB3/viewtopic.php?f=35&t=13600. change to memory-split 192/64 with raspi-config. Hi there, I installed RetroPie and put some roms in the /roms/snes/ folder. When I start emulationstation, I can see a list of my roms and can select one of them with the UP and DOWN keys (keyboard). But I cant start a rom. I have tried any other key on my keyboard but nothing happened. I also dont have a es_input.cfg in my home/pi/.emulationstation/ folder. Please use the “Generate debug log” function in the setup menu. This will generate the file /home/pi/RetroPie/debug.log. Could you send me the content of debug.log via the Contact form of this blog, please? Also, have you used the binaries- or source-based installation? Do you see an error message on the console, when you try to start a rom and press “F4” right afterwards (F4 exits Emulation Station)? Cam you start a rom from the command line by following the manual in the wiki at https://github.com/retropie/RetroPie-Setup/wiki/How-would-I-start-from-command-line,-say,-the-SNES-emulator-by-itself%3F? Please, send me the debug.log! I followed some steps you posted in another forum and removed the install completely, re cloned the git and re-ran the install script. It worked like a charm! I went ahead and followed your steps to getting EmulationStation/RetroArch installed on my system today. I followed the Binaries method, as I doubt building from source would be worth it for me. I received the es_systems.cfg error that was described earlier. Is it possible a change was made to the script since? Or should I be looking for something wrong on my end? I will check this later today! Update: I ran the script on a fresh Raspbian installation and everything worked out of the box. Thanks for getting back to me so quick! I will try to run it from command line first, if that doesn’t work, I looked at the script so I will just write the es_systems.cfg myself. I have found a bug in the binaries-based installation that affects the access rights to the EmulationStation configurations. The repository was just updated and the fixed script might also solve your problem!? Somehow the Source-code based installation doesn’t work for me, i tried it last week and afterwards i couldn’t get the Raspberry to boot, i was stuck with a single red LED. After that i tried the faster binaries-installation, which worked withouth problems. Now i wanted to give the Source-code based installation a new chance as i wanted to have the newest, best running emulators, and again i’m stuck with the red LED. Running on a fresh Raspbian, during the installation i got errormessages that no space was available, and it couldn’t write. It seems as if you might not have your resized your partition to its full size. You can check this with the command “df -h”. /dev/root shows you the free space of your “main” partition. What size does your SD card have? 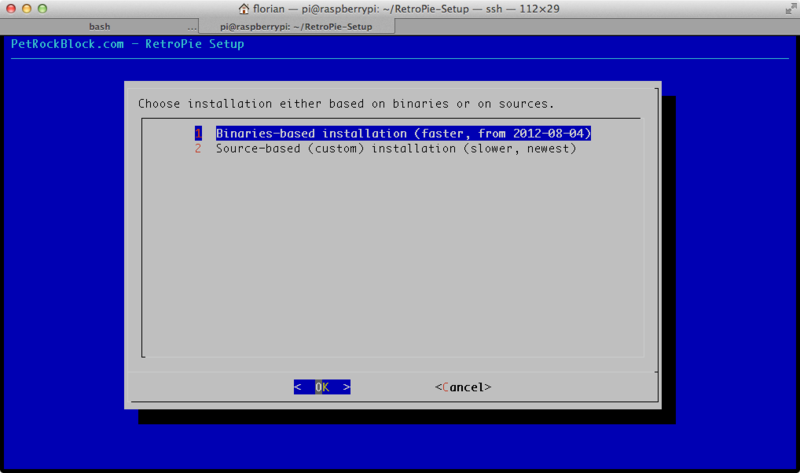 You can do a resize of your partition with the shell command “sudo raspi-config” and then choosing “expand_rootfs”. You need to reboot your Raspberry with “sudo reboot” afterwards. I have updated the free space check in the script. It now checks for 500MB of free space (it was 300MB before). I have the sound barely working and my dualshock2 controller via usb-adapter isn’t always working as it should be. Is there an FAQ somewhere to be found? It is a little bit frustrating to keep digging through 4 threads on the Rpi forums that are related to Retroarch and comments on your blog for every little problem someone has perfectly answered before. Also i would like to have a list of all the keybindings of the keyboard to the emulationstation and the emulatorcores. Hmm, Besides the official forum, I do not know any FAQ for running RetroArch etc. on the Pi. I have prepared a wiki on the RetroPie setup site at https://github.com/retropie/RetroPie-Setup/wiki. Right now, there is no content. But that wiki could serve as a source of all kinds of collected information around the components that are installed with the RetroPie setup script. WRT to Emulation Station: You can use the arrow keys for navigation, the F1 key for reboot and shutdown, and the F4 key for exiting Emulation Station. All settings for retroarch can be found in /etc/retroarch.cfg (if you use only the original RetroPie script) or, alternatively, in your home directory at ~/.retroarch.cfg. Sound is an ubiquitous problem with the RPi and is tackled by the community these weeks and months (at least that’s my impression). Running into a problem with starting emulationstation and retroarch — both are giving me bash “No such file or directory” errors. The binaries appear to be where they should be, and they both are marked as executable. Also, ldd is telling me that all the .so files are being found… Any thoughts? Hmm, I tested the current release again and everything is working here. I tested it on a fresh Raspbian installation by following the exact steps that are described above.. Everything must be run from the shell only, without X running in the background. HI there, Sorry if this is a really stupid question, but I have gone through the installation script and used the binaries based install. All seemed ok. I then put some game roms into a few of the system folders, (snes, gbc, gba and atari 2600). I then turn on my pi, log in, and then type emulationstation. I just checked this and I found a bug in the script – thank you for pointing me to that one! I commited a fix for that that should solve this problem. For you the easiest thing would be to delete the RetroPie-Setup folder and to download and start the setup script again (as described at https://github.com/retropie/RetroPie-Setup). You can then run the binaries-based installation again and things should work! Please tell me if this solved your problem. However I don’t seem to be able to start any games. Only F4 on keyboard or Start button on the gamepad seem to do anything, and that’s to open a Restart/Shutdown menu. Am I supposed to do anything to the emulators like add bios files? Make sure that the extensions of your rom file are written in lower-case letters (except for Doom, there it is “.WAD”). Instead of starting the ROMs with EmulationStation, you could also try to start them directly from the console. shows you the commands that EmulationStation is using to start the ROMs. You have to replace %ROM% with the path to your desired rom file. Has anyone used this running raspbmc? I was wanting to play NES roms using xbmc with the advanced launcher plugin. 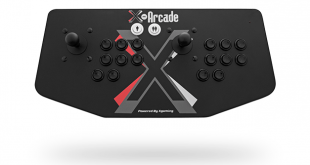 I’m not sure what to launch though: Emulation Station/Retro Arcade/NES specific emulator? I got the RetroPie suite (including retroarch) compiled on raspbmc. In trying to compile retroarch manually I noticed it was looking for several header files which on the wheezy platform exist in /opt/vc/include. These files are put there when the firmware is updated via raspi-config. Once this dependancy was installed I was able to get through the full source build of RetroPie — including, most importantly, the firmware update which installs the missing headers. I will add this to the RetroPie Setup Script. Just to be sure: Did you use the raspi-config or the rpi-update script to update the firmware? I just chceked my command history, and indeed it was rpi-update. Sorry — I mixed the two up. Upon installing the ca-certificates package, I did a git clone of git://github.com/Hexxeh/rpi-update.git. I ran rpi-update manully to confirm that it installs the header files in /opt/vc/include. I’m trying to install retropie on raspbmc but not being very successful.. it’s breaking raspbmc.. shortly after the installation of retropie starts it asks me if i want to replace or leave udev, udev.conf and a couple of other udev files… i also tried the steps ca-certificates and rpi-update to add header files btu when i check in opt/vc there is no include folder? how would i fix this? Thanks so much for this–I installed the binaries very easily and set up the NES, SNES, and 2600 emulators. I do have one question: I’m trying to use a Logitech F510 Joypad with an xbox layout. When I try to run retroarch-joyconfig, it doesn’t detect the gamepad. It shows up if I run lsusb, but retroarch doesn’t seem to detect it. If anyone has any suggestions, I’d really appreciate your help. I have absolutely no practical experience with that, but did you try to use xboxdrv (http://pingus.seul.org/~grumbel/xboxdrv/)? Hmm, I just checked this behavior myself with the root user. I run the script with ./retropie_setup.sh and everything works. Maybe you were still in an already removed directory? Usually removing RetroPie and RetroPie-Setup with “rm -rf RetroPie…” followed by a new git clone should give you a completely fresh installation. Could you maybe try to describe how this can be reproduced? I’ve noticed however, that the script creates a folder in /home called root, and in that folder it creates a RetroPie folder. The folder is empty though. Maybe I should insert a check for that. I have inserted a check for that. I was reading in the Pi forum a thread concerning setting up the wireless USB Xbox 360 controller. I looked on Amazon for one of the USB connectors (as I have an old controller laying around) and noticed that there are two of them. A Microsoft (expensive) one for $21.99 and a cheaper Xbox 360 one for $12.45. Has anyone tried the cheaper one, do you know if it works or not the same as the Microsoft brand one? hello, I am really greatful for this script, I have RetroArch up & running on my Pi, with snes ROMS tested & working. Is there another way to set up the gamepad for use withing the snes emulator>? Can anybody help? This will get the joyconfig running. I’m still stuck after this. Some of the buttons don’t register for some reason, and the ones that do, don’t write themself to the configuration. I took note of which button is which, and then tried to apply them manually to the retroarch.cfg, but I must be doing something wrong, because it’s not working. Hey, thankyou for the reply. I was getting nowhere without the “./” at the beginning of retroarch-joyconfig! Linux n00b eh? I can help you with your problem, running the retroarch-joyconfig alone isnt enough, the output need to be written (appended) to the retroarch.cfg file so it remains after reboot. Then run the button config again! Hi I’ve started to use this and love it. I was just wondering is there any way of starting Emulationstation on boot instead of going into the terminal and manually starting it. The reason being is I want to turn on my Pi with Joypad attached and not have to do anything through a keyboard or SSH. Great work though as you’ve simplified a huge process! I have this boot option at the top of my to-do list and I will commit an update for the script soon. I just committed an update for the script that will allow you to set things up for starting Emulation Station on boot. Excellent! Thank you for your hard work and dedication. Using that config the ALSA sound coming from the headphone jack is a lot clearer and has a lot less static. I will consider this in a following commit! 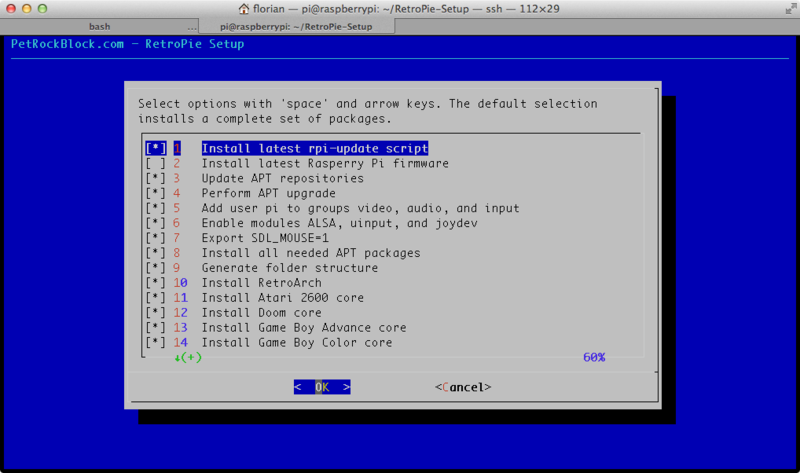 So I installed this… how would I start from command line, say, the SNES emulator by itself? Thank you for answering my noob question! And a thousand thank yous for setting up this install script, it is awesome! And now my my problems with binding is solved: config string for gamepad buttons should be input_exit_emulator_btn = “6″ instead of input_exit_emulator = “6″ for keydoard. Thanks for this, helped me a lot, except I used the guide button for exiting instead. Where are you putting this line? In the retroarch.cfg? Do you know if you can make it multi-button exit (press 6 + 7 + 8 to exit)? Great! I’m making retro-emulation console too, but with standard USB gamepads. And put it to Russian famiclone called Dendy Revolver. 1. When I try to launch emulationstation, it says “missed font”, until I place font to the /home/raspbian folder. 2. I’m get a problem like a Lukeren says. My USB keyboard get off when I start game. But can I bind system hotkeys (exit game, etc) to the joypad buttons? How I can made it? I’m try to write input_exit_emulator = “6” (or just 6), but it don’t work. 3. EmulationStation curses to roms named with “(“, “[” and “&” characters, its normally? 4. If you want to make EmulationStation more beatiful, I can help you with graphical elements. Send me e-mail if you want. Or maybe you try Typhon as frontend? thank you for your comment – your project sounds fun! Regarding EmulationStation I would suggest to get in contact with the developer Aloshi at his Github repository https://github.com/Aloshi/EmulationStation/issues! I am quite sure that any help, comments, or suggestions are appreciated! I’ve got it working great for SNES (only thing I’ve used so far), but I’m having a bit of a problem with exiting a game. F4 works while at the menu (emulationstation), but the keyboard appears dead (caps lock/numlock doesn’t work) when a game is running. I observed that the Rasperry is very sensitive to the power source. If you have the possibility I would suggest to try another source with at least 1A (1000mA). Or another USB keyboard or an active USB hub. You can try running it not in the xserver but in another console like ctrl+alt+f1, log in and start emulation station. My keyboard then wasnt dead and I can exit a game with esc, f4 closes the whole emulator. Nothing is saved when I use esc, at least I think so.